What a surprise I received when I read the word that Patter gave us for this fortnight's Scripture Challenge because on Sunday I lead a short song segment in Church and my theme was "Worship". The scripture I have used on my art was what the first song we sang was based on. The blended photo on my page is the Church where my husband and I are becoming very much a part of. I have included hearts on my page because our worship should come from our heart... our very inner being. As I said in Church on Sunday we gather together in Church to worship our God. He desires our worship and deserves our worship for who He is and all He has done for each one of us. Credits for my digital art: a little kit called Shabby Romance by Caroline B. 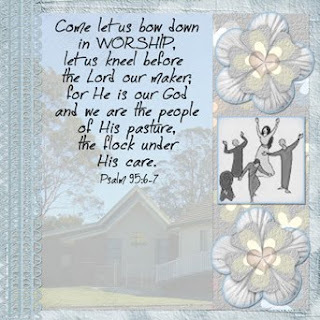 The worshippers is clipart I found on the web somewhere. I love how you used the praise hands on this. And how awesome that you were able to lead a song on worship that same day this was posted! Awesome! God is good! May you have a blessed week ahead!